Wi-Fi is the way to go for home printing convenience, enabling you to output documents from any desktop computers or laptops around the home. But what happens when you're stuck at the office or out on the road and you want to print something out back at home? HP's new e-All-in-One series of printers feature a crafty ePrint system, which enables you to send emails direct to the printer itself, after which it will automatically create prints from any attachments that you've added. Occupying the middle ground, the Photosmart Plus model adds a touch-screen colour LCD that's lacking on the more basic Wireless e-All-in-One printer, but doesn't stretch to auto duplex double-sided printing, as featured on the more up-market Premium e-All-in-One model. 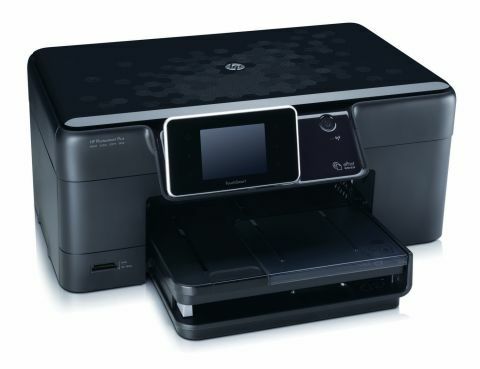 On the face of it, the Photosmart Plus e-All-in-One printer looks like a typical Wi-Fi multifunction device, combining a 9600dpi four-ink printing system with a 1200dpi scanner and memory card slots for SD cards, MMC and Memory Stick Duo. The four ink cartridges are individually replaceable and running costs are fairly low at around 2p per mono text page and 6.7p for colour, at least if you buy the high-yield 'XL' cartridges (standard yield cartridges are supplied with the printer). But there's more to the new version of the Photosmart Plus than meets the eye. Driven by a neat, yet generously proportioned, 8.9cm colour touchscreen LCD, the printer really gets into stride with web-enabled printing. After a quick and painless set-up routine, the printer can access the web directly, enabling you download apps and shortcuts for printing anything from greetings cards and Sudoku puzzles to Quick Forms for creating calendars, notebook pages, graph paper, music paper and more besides. Tasks like direct photo printing, photocopying and scanning directly to memory cards can also be handled easily and efficiently via the touchscreen. The Photosmart Plus goes the extra mile, quite literally, when it comes to remote printing. As part of HP's new ePrint system, you can configure the printer with its own unique email address as part of the Web Services set-up. This means that you can email the printer from anywhere around the world and it will automatically print out whatever you include as email attachments. In our tests, operation proved flawless with Word files and spreadsheets, PowerPoint presentations and PDFs. Better still, email a photo attachment and the printer automatically invokes its mechanised photo input tray, which can accept popular paper sizes up to 7 x 5-inches. Thankfully, 'allowed senders' lists are easy to set up, so that you can define who can and can't make prints on your printer via email. Photo quality isn't the best, because the four-ink system is a little lacking in colour space and prints lack vibrancy and contrast compared with five-ink printers such as Canon's new PIXMA MG5150, or dedicated photo printers such as the Epson PX650. However, photos still look appealing and skin tones in particular are quite flattering. Single page print speeds clocked in at eight seconds for mono text, 17 seconds for mixed text and colour graphics DTP, one minute for a 6 x 4-inch photo in standard photo quality mode and just over four minutes for an A4 photo at the top quality setting, all of which are fairly reasonable.